Whether trying to lose weight, save money, or get organized, we' re always setting goals and making resolutions but rarely following through on them. Determination and willpower aren' t strong enough to defeat our mass of ingrained habits; to succeed we have to learn how to focus our self-control on precise behavioral targets and overwhelm them, according to longtime Wall Street technology strategist Caroline Arnold. Small Move, Big Change is Arnold' s guide to turning broad personal goals into meaningful and discrete behavioral changes that lead to permanent improvement. A microresolution is easily kept and designed to nail a self-improvement target exactly and deliver benefits immediately. While the traditional resolution promises rewards on a distant "someday," a microresolution rewards us today by instantly altering our routines and, ultimately, ourselves. A wife, mother, and business innovator, Arnold uses her own successes and failures as case studies. Contrasting her career success with her personal resolution failures, Arnold recounts how by analyzing her own behavior she was able to reengineer her resolutions so that they were guaranteed to succeed every time, from losing weight to improving key relationships. 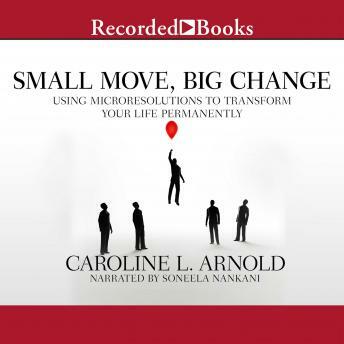 Providing scores of engaging examples from the wide circle of colleagues and friends who practice her microresolution method, Arnold also shows how her system is supported by new willpower and habit science.